The gyroid is a triply periodic minimal surface that contains no straight lines or planar symmetry curvers. It was discovered by Alan Schoen in 1970 and was proven embedded by Grosse-Brauckman and Wohlgemuth (1995). The lack of symmmetries make the gyroid hard to visualize -- I think that the best way to understand it is to look at a rotatable 3-D model (or maybe to have a sculpture in your office). The gyroid has a host of physical applications, among them understanding ketchup, materials science, and modeling the microstructures of cells. (with A. Neath, J. Cavanaugh) Model evaluation, discrepancy function estimation, and social choice theory. to appear in Computational Statistics. (with M. Feldman and M. Quivey) Intel Math Connections: A Three-Year Study of the Impact of a Math-Based Program on Elementary Teachers 2013 ASQ Advancing the STEM Agenda Conference Proceedings. (expository article) Meet the Gyroid. Published online by Plus Magazine, an expository mathematics magazine for students. A note on some upper bounds for permanents of (0,1)-matrices. J. Interdiscip. Math. 12 (2009) no. 1, 123-128. Deformations of the gyroid and Lidinoid minimal surfaces. Pacific J. Math. 235 (2008), no. 1, 137--171. 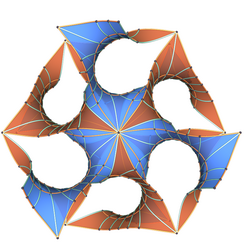 New Families of Embedded Triply Periodic Minimal Surfaces of Genus 3 in Euclidean Space. Ph.D. thesis. August 4, 2006. Shuai Hao ``An introduction to discrete minimal surfaces via the Enneper surface.'' July 2013. Paul Heidbrink ``A two parameter family of embedded triply periodic minimal surfaces.'' August 2011. Darren Garbuz ``Isoperimetric properties of some genus three triply periodic minimal surfaces embedded in Euclidean space.'' May 2010. I create my slides using Beamer, a package for LaTeX. You can download a sample LaTeX file for these talks (with no pictures). POV Ray is a very nice raytracer program that can be used to create wonderful pictures. We use Mathematica to export a mesh: see my advisor's Mathematica package. A number of examples and images of triply periodic minimal surfaces made with Brakke's Surface Evolver. Some other mathematicians whose work involves minimal surfaces include: Matthias Weber, Mike Wolf, Martin Traizet, and the Granada group.